Caravaggio painted his version of Peter’s denial within just a few months of his own death. By 1610, he was a much revered master in his native Milan and throughout other Italian ducal territories where he had lived and worked during his short, busy career. Caravaggio was known to work very quickly, usually skipping the step of drawing studies on paper. No sketches of this particular painting remain, and it’s possible that he drew the initial sketch directly on the canvas and that it is no underneath the painting we see. That’s important for one reason: Caravaggio drew human figures from live models, with no intermediate step for adjusting proportions, idealizing his figures to classical standards. Caravaggio painted just as he had lived: raw, bold, unmediated, unflinching. His human figures were too real for comfort, and his techniques were as horrifying to the artistic establishment as they were beloved by the aristocrats buying his works. The brusque realism of Caravaggio’s figures is perhaps nowhere as pronounced as in his Denial of Saint Peter, which was possibly his last painting before his death in July 1610. Caravaggio had been fleeing the law since 1606, failing to obtain a papal pardon for murder. He was exiled first in Naples, then to Sicily and Malta, then returned to the Italian mainland where people seeking revenge apparently caught up with him. Caravaggio died suddenly, possibly of disease, or possibly of an infected wound from hired assassins. The immediacy and urgency of the moment in this painting is typical of Caravaggio’s style. But it also reflects the painter’s own familiarity with crime and denial, transgression against legal and social norms, the pursuit of the law, standing accused before strangers, leaving your home province, and then being called up before accusers for your association with known criminals. Caravaggio knew all of that, and this painting places Saint Peter in that urgent world of suspicion, betrayal, and obfuscation. Caravaggio is not content, however, to let his viewers look upon this urgency with calm, cool distance. Not at all. The painting is tight and closely cropped. The background has only one salient detail: over the servant girl’s shoulder we see the flames of the warming fire, with a few sparks here and there to indicate both danger and immediacy. We don’t even have a rooster, which is such a familiar part of the story, and which appears in nearly every other renaissance depiction of this scene (there are many). The fire. The figures. The accusation. That is all. There is no artificial, classical distance. We viewers are made to feel as though we ourselves are part of the action. We might be accusing Peter. We might be defending him. We might stand with the Sanhedrin. We might wish we were never in the scene at all. Like Peter, we might be from Galilee. But here we are, in the midst of things. The largeness of the figures and the absence of scene prevents our escape. Saint Peter stands to the right, light falling on his figure from the top left. The Roman guard’s red sleeve and shiny armor is a counterbalance to Peter’s rich blue tunic. The head of the guard is covered with an ornate helmet, which is the most extreme opposite from Peter’s head, balding and exposed to the elements. Dressed as a 17th century Italian officer of a fairly high rank, the guard lifts his finger with an air of authority which the maid in the center cannot muster. In contrast, Peter is wearing 1st century clothing, befitting any ordinary citizen. These extremes heighten the ordinariness of the servant girl’s soft and sensible clothes, with her white head scarf. Her clothes, though decidedly 1st century, might also go completely unnoticed in a 17th century crowd. Caravaggio’s jarringly simple depiction of the girl belies her absolutely central role in the story. 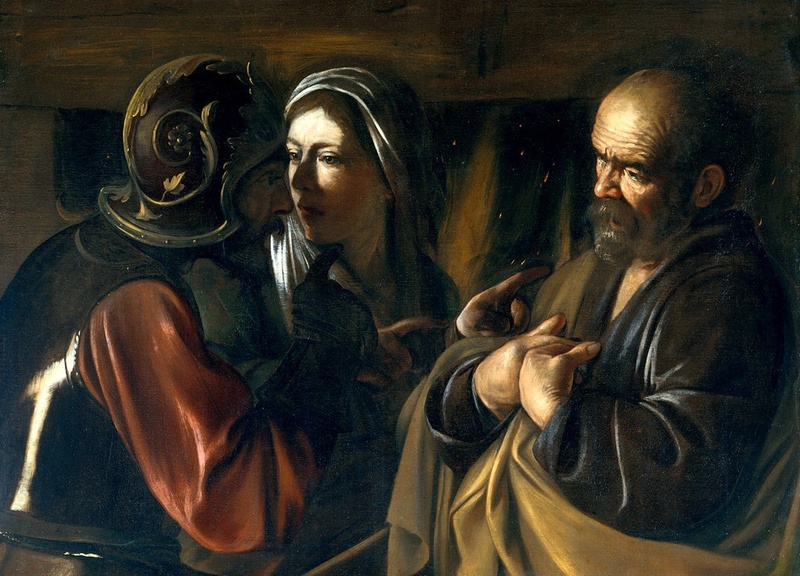 In the gospels, she is the cause of Peter’s first two denials of Christ, symbolized perhaps by her two fingers pointed at the failing disciple. Another obvious contrast is the amount of light drawn on her face. Peter’s face is in total light. The soldier’s face is in total shadow. The servant girl’s face is only in half shadow, but her eyes are fully illuminated. The contrasting play of light and dark on her face heightens the contrasting interplay of doubt and certainty in her probing questions. By reason of the lighting alone, we see that Caravaggio meant to draw attention to the servant girl’s eyes. But if that’s so, why would he draw her eyes so badly? This is Caravaggio at the height of his skill. Despite his four-year run from the law, Caravaggio had managed to stay alive due to wealthy patrons who loved his work. They arranged for shelter on the estates of friends, and arranged for his escape once his whereabouts were discovered. This sheltering was risky, and it would not have been a risk worth taking were it not for his unparalleled powers and skill as an artist—the sort of skills which could work miracles for the status of any patron. Given this level of skill, why are the servant girl’s eyes out of focus? While Peter and the soldier seem fairly occupied with one another, the girl has lost the attention of both. As the fourth participant in the scene, we feel the girl is about to look at us, ask us to corroborate her story, ask us to point our own finger at the man who denied Christ. Peter is timid, shy, worried for his own safety, committed to whichever version of the truth is politically expedient. Peter’s loyalty fails in the face of power. The guard is imperious, indignant, committed to whichever version of the truth is preferred by the powerful people who employ him. He allows his understanding of truth to be controlled by those who pay his salary. The servant girl is not committed to a particular power, like the soldier. Nor is she committed to a particular threat to that power, like Peter. She’s on the fence, and her eyes betray that inner ambiguity. She’s pointing at Peter, but her fingers fail—one finger doesn’t quite point directly at him. She’s looking at the soldier, but her eyes fail—one eye doesn’t quite focus directly at him. Her eye wanders our direction, inviting us into her quandary. The servant girl is right. Peter did know Christ, and he has already denied it twice. But the servant girl knows Peter’s Galilean dialect, and whatever she tells the soldier is absolutely correct. We also know that Peter is just about to deny Christ again. The question here is not whether Peter will tell the truth or not. His third denial is certain. Instead, the girl wants to know why Peter would even appear at the trial, risking himself in such a way. She seeks clarity. Her eyes are just barely out of focus—just enough to create space, inviting us to enter the conversation and corroborate her story. Perhaps we also want to accuse. Perhaps we are tempted to join the ranks of hell in pointing out the guilt of others, rather than ask ourselves the much more difficult question: do I know Christ myself? In the maid’s eyes, Caravaggio has depicted the dilemma everyone faces. That question and this painting both demand we participate in the eternal drama. Is Christ a savior or a criminal? Are you with him or against him? Where do you stand? The maid stands in the groundless middle, her eyes demanding that we make our commitment clear. Choose one, and find safety in power and authority. Choose the other, and you will forever reject that safety and power.